Irish actors David Pearse, John Kavanagh and Diarmaid Murtagh have joined the cast of ‘Vikings’, which is currently shooting at Ashford Studios in Co Wicklow. The three actors have joined lead cast members Gabriel Byrne (The Usual Suspects), Travis Fimmel (Tarzan), Jessalyn Gilsig (Glee), Gustaf Skarsgard (The Way Back) and Katheryn Winnick (Bones) on the set of the €30m Irish co-production for The History Channel. ‘Trivia’ star Pearse will play the character of Svein on the nine-part series, which is being co-produced by Irish producer Morgan O’Sullivan’s World 2000 Productions and Canada’s Take 5 Productions. 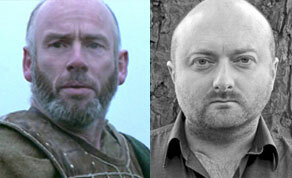 Kavanagh has been cast as the Seer, while Murtagh will play Leif and Smith has been cast as Saxon. A number of other Irish cast members are taking part in the production in minor roles. The 18-week shoot got underway on July 9 and is now in production on its second block of episodes with ‘The Tudors’ director Ciaran Donnelly at the helm. Swedish director Johan Renck (Breaking Bad) directed the first block of episodes, while Ken Girotti (Rescue Me) will take the reigns of the third block of episodes next month. Production on the series, which has been created and written by Michael Hirst, is due to wrap in November.